A first league win of the season for Cliffe FC 1stXI, a heavy defeat for Cliffe FC Reserves, and a cup “draw” abandonment for Cliffe FC Sunday – is all marred by a serious injury to Andy Kirkham suffered on Sunday morning. FT: Cliffe FC Sunday A – A Hounds FC – Game abandoned on 83rd minute at 2-2. An eventful morning down at Oxen Lane on Sunday, Cliffe FC Sunday and Hounds’ FA Cup tie abandoned at 2-2 on the 83rd minute due to Hounds being reduced to 6-men due to three red cards, and two injuries. Sadly, from Cliffe’s perspective, Andy Kirkham’s serious injury – confirmed as a broken bone and ruptured MCL in his right knee – is a massive dampener on Cliffe’s efforts that saw them comeback from 0-2 down to bring it back to 2-2 before the match was abandoned. Whilst it’s now in the hands of York FA to decide the outcome of the tie, the events of the match went as follows – Hounds looked to dominate from the outset, but Cliffe stubbornly wouldn’t lie down for the Hounds, and the score remained 0-0 until midway in the first half, a deflected long range shot ending up in the back of the net from Hounds’ right back, 0-1. Hounds led at the break, but Cliffe were very much in the tie. Hounds were reduced to 10-men early in the second half, the same incident that caused Kirkham’s injury. A horror tackle dealt with with a straight red. Hounds then extended their lead, another deflection, from a long range effort from Jamie England hitting Matt Birch on the way in, 0-2. Hounds two goal lead was something for them to hold onto, as Dan Collins got Cliffe back into it from a header for 1-2 – as Hounds eventually found themselves down to 8-men! Cliffe were now ruthless to get themselves back in the game and pushed Tom Hogg up top. Dan Collins won Cliffe an indirect freekick inside the Hounds penalty area, Dan laid the ball off for brother Tom who smashed the ball past the crowd of Hounds players on the line for 2-2. Hogg’s presence up top was felt further as he won a penalty kick for Cliffe with 6 or 7 minutes remaining. Tom Collins saw his spot kick saved, but was ordered to be retaken due to encroachment – however this would be the last action of the tie, as Hounds found themselves down to 6-men due to injuries and meaning the game had to be abandoned at 2-2 on the 83rd minute. A-A. 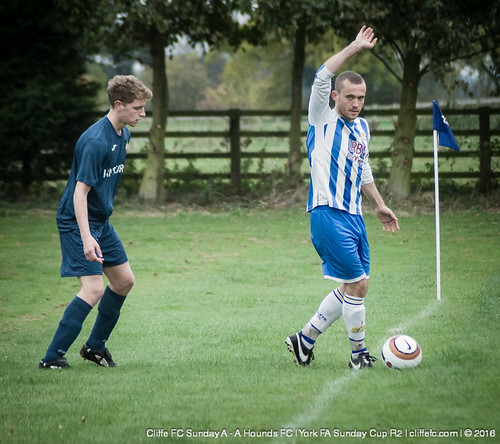 Next weekend, Cliffe FC Sundays are back in League action, away to Thorpe United’s Sundays – and this weekend’s game is very encouraging for Cliffe to build upon as they look to drag themselves up the Sunday league table. Cliffe FC would like to extend their well wishes to club servant Andy Kirkham, as mentioned above he’ll now face a lengthy stint on the sidelines, and everyone connected to the club wishes him well on he hopefully speedy road to recovery. Saturday was a good day for Cliffe FC, an important win against Heslington. 5-3 was the final scoreline, Dan Collins scoring a hat-trick, Tom Grundy and OG completing the scoring – a first league win of the season to move Cliffe off the foot of the table. A strange start to the game for both sides, with the visitors having late arrivals meaning Cliffe began the game with two extra men – a coincidence with last season’s same fixture where Cliffe only started with 10-men due to a car being lost on the way to the game. With Heslington set up to hold on stubbornly and slow the game down, Cliffe were frustrated and couldn’t get any positive momentum. Cliffe eventually had a breakthrough, the ball falling to James Grundy in the box who somehow managed to set Dan Collins up with his standing foot, Collins nipping in at the foot of the post before the defender and keeper, 1-0 to Cliffe. Heslington, now up to 10-men, got an immediate equaliser, their superb #10 breaking down the right to set up the away side’s unlikely goal, 1-1. 1-1 was the HT scoreline as both sides now had 11-men each. Cliffe were urged to up it a level, and get themselves in-front having being the much better side in the first half without the scoreline showing. Early goals in the second period got Cliffe into a 4-1 lead, Dan Collins with a header for his second, Tom Grundy with a superbly executed volley, and Collins then rounding the ‘keeper to complete his hat-trick and make it 4-1. Cliffe looked like they could run riot from this point but Heslington remained stubborn and got another goal for 4-2, then an individual effort from their clear MOTM #10 made it 4-3 with about 15 minutes left. Kev Taylor continued to be a threat for Cliffe on the right wing, and Cliffe’s fifth came via and own-goal, a cross converted by the Heslington defender for 5-3 and settle the game beyond doubt, 5-3. Alex Oliver at centre-back was awarded MOTM for his strong display. Some good football played in majority of the game, and positives to build upon for Cliffe to go along with the three points. Next week, it’s County Cup action, at home to Hodgons AFC from the East Riding County League. More lessons learned for Cliffe FC Reserves, as they go down to a heavy 9-1 defeat. Lewys Williams headed in Cliffe’s only goal, and other than that missed chances and lack of recognised goalkeeper is dearly costing Cliffe’s second string at the moment. They are in County Cup action next week also, away to Brandesburton Reserves – a familiar opponent from Cliffe FC’s County League days in 2007-2009.